It's starting to feel more like my kitchen. We are going to put wide plank white bead board up 3/4 up the wall. I finally found the paint color I liked, after adding a little white and a little gray to my blue. Scotty decided he wants tile for the back splash, which I'm fine with, so more decisions to make. Our goal is finish the upstairs before we move on the downstairs. This is a good goal and keeps the sanity around here. I'm guessing it won't be until next year till we start the downstairs. Which I'm fine with. After last summer and remodeling full board, I like this slow pace and finishing feels great. So with all our finishing projects I have lists. Does anyone else love lists?! Been planing the mudroom. Love this room. I got this wallpaper sample and I think I love it. It's matching my gray ceiling perfect. 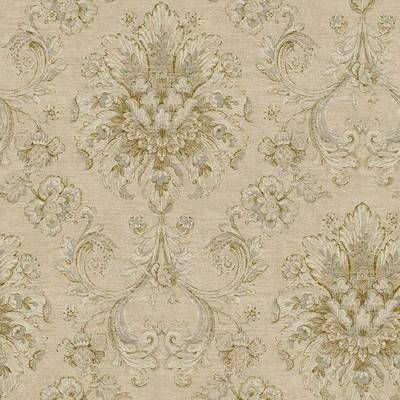 This is a damask wallpaper. It has golds, tans, blue gray and off white.....a lot of colors I love. More on this room to come... I have a couple antique dog pictures that I'm planing to hang in this room along with Katie girl and all her cousins, because we all love our dogs and they are like family! I love the contrast of a classy wallpaper with something really rustic like dogs..... And really a mudroom is the perfect place to have a dog gallery, don't ya think? !